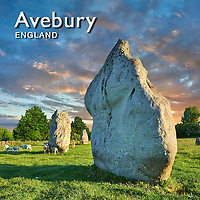 Avebury is a huge Neolithic henge monument that surrounds the present day village of Avebury. A henge is a circular ditch and bank and at Avebury the ditch and bank are a formidable 21 metres (69 ft) wide and 11 metres (36 ft) deep and date from about 3300–2630 BC. Inside this henge are 3 stone circles the outer of which, dating from around 2900 BC, has a massive diameter of 331.6 metres (1,088 ft) with stones that vary from 3.6 to 4.2 m high. From this henge runs the West Kennet Avenue which is an avenue of two parallel lines of stones 25m wide and 2.5 km in length. This leads to Silbury hill which is a man made neolithic monument 40 metres (131 ft) high and covers about 5 acres (2 ha) which took an estimated took 18 million man-hours, or 500 men working for 15 years, to build. It is the same height as some of the smaller Egyptian pyramids. Avebury is an incredible site and the amount of effort which went into its construction points to a well ordered sophisticated civilisation that could work together on these monumental projects. This added to the complex of monumental monuments around Stonehenge, which is only 20 miles ( 32KM) away,and the two sites point to a neolithic people that had a complex belief system that sadly has been lost to the historical record. Theories about the uses of all of the Neolithic sites of Britain are constantly evolving as new archaeological methods allow a deeper insight into how they were constructed. New finds at Stonehenge and Orkney are opening up the neolithic archaeological record and seem to be pointing towards the importance of ancestor worship for these neolithic people. It has been suggested that Avebury was used for ancestor worship on a monumental scale. Download as high resolution stock royalty free images of food picture images to download on line.